Alan Simpson: Cut Entitlements, Defense; Not Aid To Poor : It's All Politics Alan Simpson, the former Republican senator, said the real fiscal threats are entitlements and defense spending, which should be cut, not programs for low-income Americans. He singled out a Defense Department health insurance program that costs taxpayers $53 billion annually. 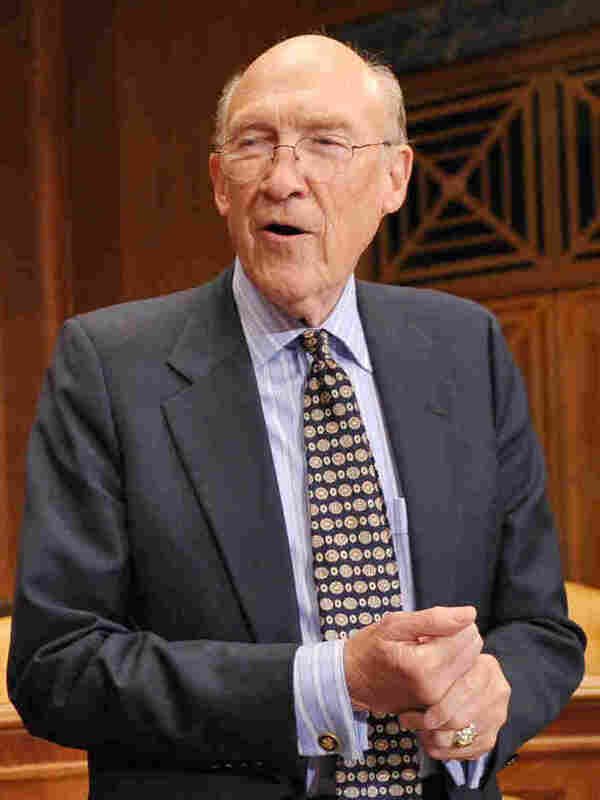 Alan K. Simpson, the wise-cracking, 79-year old, ex- Republican U.S. senator from Wyoming, has been around politics and Washington long enough to harbor few illusions. Neither does he have much fear of speaking his mind since he left the Senate in 1997. Most recently, he put his wry, straight-talking approach in the service of President Obama's recently defunct fiscal responsibility commission, which he co-chaired. Which made Simpson a good choice to talk to as Washington's budget war heats up. Steve Inskeep, co-host of Morning Edition asked Simpson if he thought the president's proposed budget for fiscal year 2012 included enough of the commission's recommendations. A major criticism of the Obama budget submission was that it didn't lean heavily enough on the panel's work, especially its call to rein in entitlements — Social Security, Medicare, Medicaid — and defense, what Simpson calls the "big four." STEVE: Does it bother you at all that President Obama having convened the commission ... did not basically propose your budget plan when it came to laying out a budget? SIMPSON: No it doesn't bother me at all because he's talked about a lot of our stuff. It's down in the bowels there, it's stuff that the American people don't see. But we still have some leftover staff and they're saying "You'd be surprised at how much stuff that he's mentioning." Which opens the door to where they've got to go but, no, I'm not disappointed in him. Proving how free he is to break with the orthodoxy of his party, Simpson recommended that Obama and Republicans alike leave social safety net spending alone and go after the big four where the real savings are to be had. STEVE: Do you think that it is possible, however you figure out the numbers, to balance the budget or move it close to balance while preserving what we call the social safety net that has grown up in this country across many decades? SIMPSON: Heating. That Leap group. SIMPSON: Yup, that's a critically important thing. That shouldn't even be touched. You don't need to touch that, you need to go get rid of 250,000 contractors in the Defense Department where you can really pick up some small change. STEVE: So you think the safety net can be preserved – that's not really where the big money is anyway. SIMPSON: No! Child nutrition. WIC. Those things don't need to be chopped up. Go for the chunk. Go in there to the Medicare and start hammering and that's what we tried to do with a $400 billion cut. Steve asked the former senator if he thought the U.S. could maintain its military pre-eminence even with significant cuts in military spending. He had no doubts it could, Simpson said. SIMPSON: Without any question. We have a defense budget now which is larger than all 14 other countries (with the largest economies.) That ought to get you somewhere. SIMPSON: Yes, except China, of course, and now they're gearing up. We found stuff in the Defense Department that you can't believe. Here's one for ya. There's a DOD health system, its separate for Veterans Administration, its separate from Obamacare. It affects 2.2 million military retirees. That's how you pass or kill something in this country, you use emotion, fear, guilt or racism, and I've been in them all – I did immigration, nuclear, Social Security, ageing – I learned where the long knives are.